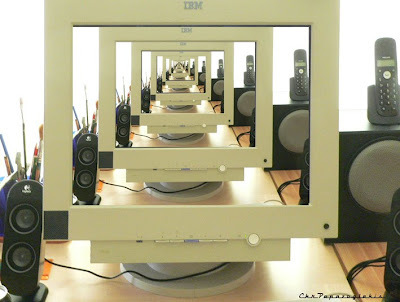 an infinite reflexion of a screen staring at a screen staring at a screen, or an infinite series of me watching me watching me watching me. ok, hung over, had a busy week. Great work, brilliant interpretation of the theme. Such a simple image, but such a resounding illustration of the infinte. Very effective, very good. How did you do that!? It's very cool. well thanks. I just recorded a photoshop script that copy the pictures, paste it, then resize it. I wanted to try and create a script that would execute that other script ad libitum, not sure if it would work and just copy-paste-resize untill the end of times, but I still need to use this computer.